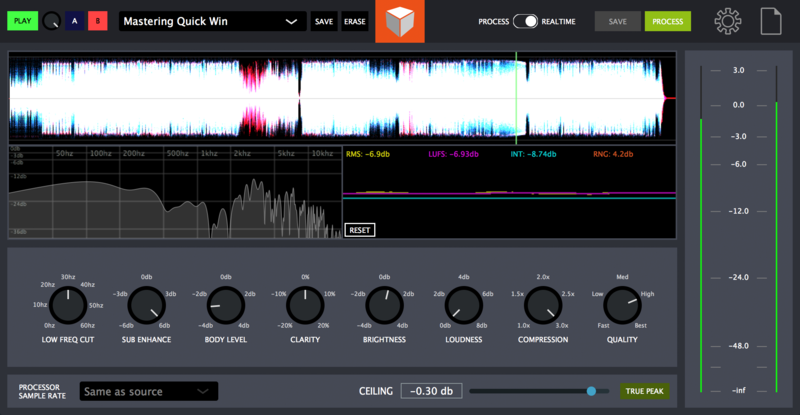 Blackbox is an all-in-one mastering system that combines a simple interface with powerful track mastering capabilities. Blackbox is a mastering grade processing suite intended to make your music sound polished. Blackbox faithfully emulates a natural analog style mastering chain and accurately configures the settings based on user preference. Blackbox adds punch, loudness and quality to your mix, whilst providing the overall balance found in many of today's top productions. Blackbox is having your music mastered with some simple dials and presets the way you want it to sound. Make your demos sound great and give your streamable media the wow factor. Mac - download the dmg file and extract the binary application. Put the application in the applications folder on your mac. Run the application. If you get a security warning saying it can't be run as settings only allow applications from Mac App Store, don't worry. Goto Apple -> System Preferences -> Security & Privacy and you should see a notification about "BlackBox was blocked", click on "Open Anyway" which should allow the program to run! Please note that Blackbox uses SSE instruction set so computers with CPU's older than 2012 may have issues. Please check that the programs runs on your machine before purchasing. This is a service release intended to fix potential issues. This is a service release intended to fix potential issues. The rules on saving in trial mode have also changed to allow for saving with intermittent silences. The new realtime mode is an approximation of the final mastered audio. It should be used as a workflow tool only. We will also be dropping support for 32 bit builds from this release onwards due to backwards compatability causing instability issues.